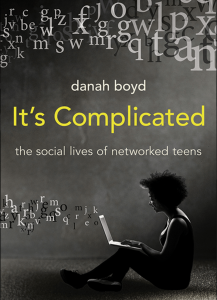 Guest blogger Wendy Grossman looks at our understanding of teenagers’ lives as ‘networked’, as ‘digital natives’, in light of danah boyd’s recent book ‘It’s complicated’. Wendy writes about the border wars between cyberspace and real life. She is the 2013 winner of the Enigma Award and she has released a number of books, articles, and music. At the May 2015 Internet Policy Forum, sponsored by Nominet, Emma Mulqueeny discussed her part in writing January’s Digital Democracy report commissioned by Speaker of the House of Commons, John Bercow. Mulqueeny founded Rewired State, a group whose ‘hack day’ events let computer coders hash together ideas to show companies and government the change technology can make. Young Rewired State does the same for under-18s. Mulqueeny outlined the medium-term future when a generation of teens will bring their followings to politics. Because of their use of social media to find and comment on news, they expect to have a voice and know how to influence. The crowd born in 1997, who are, as Mulqueeny said, “about to pop out the top of education”, have grown up alongside social media. Younger teens have never known anything else. Our understanding of how democracy works will depend on how we understand these changes. This is the age group that Microsoft researchers danah boyd and Alice Marwick set out to understand for It’s complicated: The social lives of networked teens. Between 2005 and 2012, they interviewed teenagers and their parents all over the US and, as boyd notes, although some specific sites (such as MySpace) have been abandoned in favour of Facebook, Instagram, Twitter, Reddit and Snapchat, the principles hold up. One reason boyd embarked on this research was the poverty of media coverage of this group. We read regularly about predatory strangers, suicides and a lack of care for privacy, but not what the teens are doing. In 1968, my mother feared Manhattan strangers would inject me with addictive drugs; if your fear is too absurdly out of touch, your teen will ignore you, then and now. Teens being the same as they ever were is a key theme in boyd’s book. The shiny, distracting technology is just a vehicle for their real desire to socialise with their friends. My generation used telephones; boyd’s generation had Usenet and online bulletin boards; this generation has social media and texting – but it’s never about the gadgets. The biggest difference today is the loss of physical independence – the 2013 report from the Policy Studies Institute showed the shrinking distance UK kids have been allowed to roam since 1970 and, as boyd writes, the same is true for US teens – even their bedrooms may be invaded by monitoring parents. It’s not that they don’t care about privacy; it’s that they lack agency. Teens take privacy risks, she says, because we have left them no better choices. Parents and teachers shocked by what kids share online suffer from two misunderstandings. One is that this culture has its own, different rules, which outsiders misinterpret as no rules. More important is that the 166 teens boyd and Marwick interviewed outline often quite elaborate strategies for cloaking their communications: they speak in insider-only codes, first-generation Americans use cultural references their immigrant parents won’t get, and pronouns substitute for names so only insiders can interpret the gossipy nuances. One teen, knowing her mother only opens her Facebook page when she was in school, deactivated her account every morning and reactivated it when she came home. A surprising number of interviews reveal teens trying to protect their parents from worrying about them. There is, boyd also points out, considerable adult double-think. Parents who fret about the predatory strangers their kids might meet online themselves use dating sites. We call kids ‘digital natives’ and then complain when they behave differently than we expect. The ‘digital native’ myth is an idea I’ve always contested myself intuitively and that academic research has also questioned, in 2009 and 2011: surely the digital natives are those who understand the internet’s underpinnings and know what’s happening behind those slick, shiny interfaces? My mother couldn’t grasp how to plug a stereo system together – does that make me an ‘audio native’ because I could? As boyd finds, teens vary in their technical understanding as much as any other demographic group: a few can code complex algorithms that make them rich before they’re 20; some can use readily available scripts to exploit government-released open data; most can use the software and services provided to them; the least able text friends to ask for help with Google searches. The failure to understand this is hugely damaging, as boyd writes, because many government and education policies assume that the digital divide does not apply to the younger generation, and therefore digital literacy does not need to be taught. In fact, the texter above had so little access to computers that searching was painfully difficult. Ignoring these disparities in access and technical skill further marginalises an already-struggling group. Many teens assimilate grown-ups’ prejudices. Schools don’t trust Wikipedia, and the lesson kids hear is that Google is more reliable. Whereas the reality, boyd points out, is that Wikipedia’s talk pages are a fabulous way to teach how knowledge is created, disputed, and curated, whereas ad-driven Google’s search algorithms are closely guarded secrets. For anyone dealing with kids and digital media in a practical manner, this book has something of value on almost every page. In writing the book, boyd hoped to give teens a voice, including with their parents. In both domestic and wider public and policy debates about their digital futures, teens themselves are rarely heard.